A controlled watching brief was carried out by archaeologists from the Surrey County Archaeological Unit during the construction phase of the redevelopment of St Michael's Road, Ashford, Surrey. An earlier evaluation of the site had revealed the presence of possible prehistoric and Saxon features and archaeological work conducted at the adjoining site of St Michael's school revealed the presence of prehistoric activity in the form of Mesolithic, Neolithic and Bronze Age flintwork. Both sites also produced pottery of Saxon date. The site is located on the river terrace deposits associated with the river Thames and its tributaries and lies within a large meandering loop of the Thames, to the south of Ashford town centre. The depth of the surviving archaeology differed across the site. In the north, the archaeology was preserved at greater depth and only groundworks extending below 0.70m were monitored. In the south, all groundworks extending below 0.40m were subject to monitoring and as a consequence the ground reductions were conducted as a series of small area excavations. The phased plans of the excavations at St. Michael's Road are attached below. By far the largest find category from the site, totalling 379 pieces, was struck flint. The overwhelming majority of pieces are clearly components of a typical assemblage of later Bronze Age date. The majority of sampled features produced few worked flints, but four ditch segments, two each of later Bronze Age and medieval date yielded between 10 and 25 flints. One Bronze Age pit contained 35% of the overall site total for flint, and a waterhole of Bronze Age date produced 10 flint artefacts. There is very little evidence of earlier prehistoric activity in the flint finds. Evidence for later prehistoric activity was more strongly represented by finds of characteristically simple tool forms (mainly scrapers and piercers) of Mid to Late Bronze Age date from a series of coaxial field boundary ditches. The pattern of flint distribution at St Michael's mirrored the distribution recorded for the Bronze Age field system at Hengrove Farm and at Ashford Prison, where only 43 flints were recovered from a much larger expanse of exposed field boundaries. As with other Bronze Age sites on the Thames gravels, a low quantity of pottery was recovered. A few sherds of Bronze Age, Roman and Saxon date where present, but by far the most important were the substantial parts of two wheel-thrown cooking pot/jars in the Late Saxon (11th century) shell-tempered ware, and a base angle sherd that may belong to one or other of them. 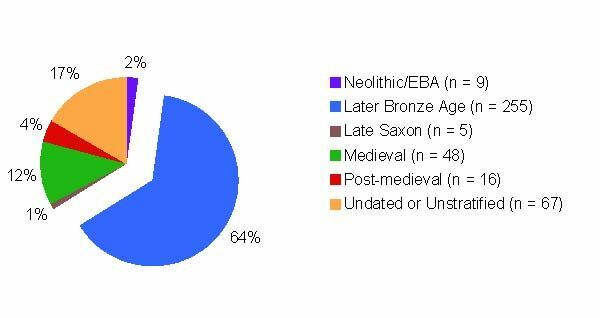 The majority of the pot recovered (c81%) was of medieval types, mostly belonging to the High medieval period of the late 13th and early 14th century, but including some that may pre-date the Conquest. The excavations carried out at St Michael's Road proved to be quite extensive. The discovery of an isolated pit or waterhole of Neolithic date suggests limited utilisation of this area of the gravel terraces during that period. It is not dissimilar to the level of activity recorded at the nearby site of Hengrove Farm Quarry, where evidence suggested some degree of woodland clearance and the establishment of semi-permanent pastures during the Neolithic period. The rectilinear Bronze Age ditch systems revealed across the site are very similar to those recorded at the nearby, contiguous sites of Ashford Prison and Hengrove Farm Quarry, and is of the same alignment and similar in form to those revealed at Ashford Hospital. The presence of such Bronze Age field systems has become a recognised and more frequently occurring feature of the Thames Valley gravels and their existence at St Michael's Road extends their presence by some 2km to the south and east of the above sites. The early and mid periods of the Bronze Age are not definitely represented in any of the St Michael's Road assemblages and it may be that the field systems revealed are a later development on the margins of an older and more established system of field boundaries.